The front-end has design cues borrowed from the Hyundai’s new design language, with the lamps placed high up like the Kona SUV. The large ‘cascading’ grille, the creases on the side (one near the front fender, the other over the rear wheel well and the kink in the lower window line of the rear window) may not make the new Santro universally appealing - but at least it is not plain jane. From what we can gather, the Santro will be offered with 14-inch steel wheels with full wheel covers as standard across the range. The top-of-the-line variants will get a reversing camera and reverse parking sensors, though the Santro makes do with only two sensors (more care may be needed while parallel parking). The interiors will be familiar if you’ve been in modern Hyundai hatchbacks, especially the Grand i10. The cabin layout, the combination of beige and black upholstery, plastic quality and switches feel like from a segment above. Hyundai will also offer body-coloured trim on the inside on a yet unannounced ‘sporty’ variant which includes the said trim around the AC vents (like the Tata Tiago), the centre console, the gear lever and even the seatbelts! This may have been done to attract a younger crowd. The biggest talking point inside is the 7-inch touchscreen infotainment. First impressions are that this is the same unit as found on the Grand i10, which means the UI and interface feel top notch. With features like Android Auto and Apple CarPlay smartphone connectivity and reverse parking display, the multimedia system adds to the premium feel on the inside. All four doors are offered with power windows, though this feature may be limited to the top-end variants. 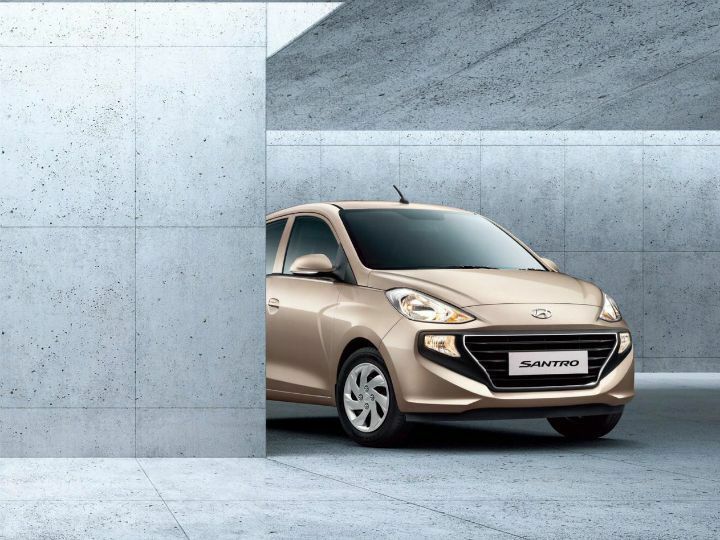 Hyundai claims the all-new platform that underpins the Santro makes it structurally safe. While a crash test will give us a proper idea, Hyundai is offering the Santro with ABS+EBD and a driver-side airbag as standard for that peace of mind. We sent the biggest members of our team to test out Hyundai’s new small car, and we are happy to report that it fits two 6-footers one behind the other with ease! While we were not able to measure the car as thoroughly as we usually do during our road tests, initial impressions are positive in terms of legroom, knee room, head room and under thigh support. The sense of space is obviously helped by the large glass area, be it the front windshield, the rear windows or the large rear windshield. But it’s the small things that make this small car feel big - there’s enough space for two people to sit side-by-side and not hit each other's elbows or the door pads. The front seats have enough space for the rear passengers to tuck their foot under them. The new city car standard? While the numbers may suggest that the Santro has the second most powerful engine here, in reality, it offers a very sedate performance. The engine revs cleanly, but there is never a point when you feel the power kick in. You could potter around town in fifth gear at engine speeds as low as 1800rpm and the engine won’t feel jittery. But this is not peppy or sporty by any stretch of the imagination. The light clutch, sure-slotting manual gearbox and the smooth AMT match the laidback character of the engine. We reckon the Santro’s AMT may be the smoothest one in the segment, but we need to test it out thoroughly to say that for sure. While Hyundai claims to have worked on making the Santro feel more comfortable by employing more NVH-lowering materials on the inside, engine noise does seem to creep in. While our drive time in the new Santro was extremely limited, the suspension seems to be tuned for a softer and comfortable ride. There is some body roll when taking corners but it does not seem to get unsettled. Bookings for the new Hyundai Santro begin tomorrow (10 October 2018) till 22 October 2018, interested customers can book one for an introductory cost of Rs 11,000 online. The car is set to be launched on October 23rd. Hyundai promises a low cost of ownership and maintenance. Peace of mind is also improved thanks to a first-in-segment warranty of 3 years/1,00,000km warranty and 3-year roadside assistance. The Hyundai Santro is expected to be priced in the Rs 3.5 lakh to Rs 5 lakh price bracket, and if it is as good as it seems like, it could give the competition some serious headaches. 2.72 price in your add???? 2.72 price in your add???? @Atharva Ex-showroom price of this new santro is starting at Rs. 3.5 lakh. @Atharva Ex-showroom price of this new santro is starting at Rs. 3.5 lakh. Share your experiences with Santro? Confused about Hyundai Santro 2018?